Первая официальная для России и стран СНГ версия альбома "Mark Of The Necrogram" шведской death/black metal группы Necrophobic выходит 7 декабря! / First official Russian/CIS version of album "Mark Of The Necrogram" of Swedish death/black metal band Necrophobic is out on December 7th, 2018! NECROPHOBIC - death/black metal группа из Стокгольма, Швеция. Создана в 1989 году. Название было взято из песни Slayer. "Mark of the Necrogram" - название нового студийного альбома NECROPHOBIC, который вышел 23 февраля 2018 года. Этот тираж - первая официальная версия для России, Армении, Азербайджана, Беларуси, Грузии, Казахстана, Кыргызстана, Молдовы, Таджикистана, Туркменистана, Украины и Узбекистана. Данный релиз знаменует собой ещё один шаг по лестнице к трону Смерти. Горестные мелодии с яростными риффами дополняются сильным и демоническим вокалом Anders Strokirk, который воссоединился с группой через 20 лет после выхода “The Nocturnal Silence”. Альбом украшает монументальная обложка Kristian “Necrolord” Wåhlin. Издание по лицензии Century Media, 400 копий в коллекционном 6-панельном digipak, содержат 16-страничный буклет. NECROPHOBIC - death/black metal band from Stockholm, Sweden. Formed in 1989 by David Parland and Joakim Sterner to create a darker kind of death metal than what was being made at the time. The name was taken from a Slayer song. 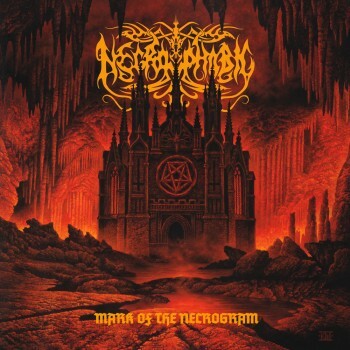 “Mark Of The Necrogram” is the title of NECROPHOBIC’s new studio album, which released on February 23rd, 2018. This edition is first official version for Russia, Armenia, Azerbaijan, Belarus, Georgia, Kazakhstan, Kyrgyzstan, Moldova, Tajikistan, Turkmenistan, Ukraine and Uzbekistan. It marks another step up on the staircase to the death metal throne, delivering sorrow-laden melodies of musical mastermind Sebastian Ramstedt, furious riffs of rhythm guitarist Johan Bergebäck, the pounding bass of Alexander Friberg, battering war drums by the band’s heart and soul Joakim Sterner and the demonic voice of Anders Strokirk who reunited with the band more than 20 years after the release of “The Nocturnal Silence”. “Mark Of The Necrogram” comes with an eerily monumental cover artwork of Kristian “Necrolord” Wåhlin. Release under license from Century Media, 400 copies of 6-panel digipak, contain a 16-page booklet.